A once calm crew suddenly bustles with excitement and Maribel overhears words such as “pirates” and “ghost ship.” It’s during this time her curiosity surges and she can think only of her beloved book, The Notorious Seafaring Pyrates and Their Exploits, by Captain Ulysses Jones. Soon, their ship is attacked, and Maribel comes to find out that instead of pirates, those aboard “The Ghost Ship” are in fact Privateers from France. The captain of the privateer vessel, Captain Jean Beaumont and Maribel’s father have a past that needs settling, and against his usual rules, a dual ensues, leaving Maribel’s father dead and Maribel in the hands of Captain Jean Beaumont. With her fiery spirit and desire for adventure, she begs to stay on the ship and work with them, an agreement that everyone is hesitant about at first. Beaumont agrees to let her stay, but an attack puts Maribel in danger and places Beaumont into a coma, leaving his crew to take Maribel to Mother Superior of St. Mary of the Island Orphanage, where all memories of the privateers are to be forgotten. But for how long? At St. Mary of the Island Orphanage, Maribel is known for getting in trouble, especially when she climbs into trees to read her books. After spending eleven years at the orphanage, someone comes to get her and take her back to her mother and grandfather, who were not dead as she previously believed. Instead, it was a ploy for her father to take her away. Excited to meet the family she once knew, yet still desiring to know more about this past as a privateer she so vividly remembers, she gets ready to make way for New Orleans. Before departing, however, she meets some old privateers she once knew and sees a ship that is familiar, triggering memories from her past. Upon arrival in New Orleans, she comes to find that she is going to have a very hard time fitting in, especially with her wild ways and less than proper mannerisms. It is when her family gets in trouble that she is put back into the hands of a privateer she once knew as a child, changing the rest of her life as she knows it. 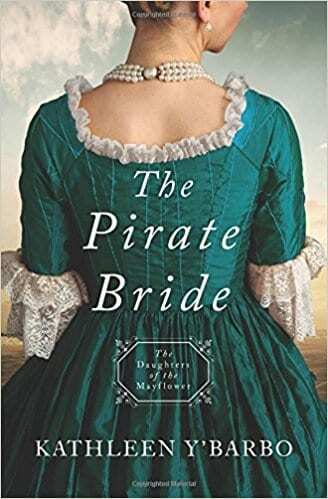 The Pirate Bride is a deliciously addicting tale that places you right into the heart of adventure. Not only are Maribel and Captain Beaumont extremely relatable and likeable, but it’s easy to understand Maribel’s journey back into society after having the adventure of the open seas. Her love of books, her need for adventure and her attitude are addicting. The fact she’s a strong woman, even at a young age, goes to show that even though one may be considered young, and although she is a female, she can be strong and demand the attention she deserves. This book is perfect for anyone who wants a quick, easy read or those who want a taste of adventure without leaving their own home. Quill says: A delightful read that enchants, delights and makes you crave adventure.